Infantry forces are in enemy territory, in need of supplies. The enemy has blocked all ground routes leading to the forces, and the only way for them to receive supplies, ammunition and food is via airlift. At the same moment, an aircraft flies over and drops the necessary supplies near the force. This is one of many scenarios which might occur during wartime. 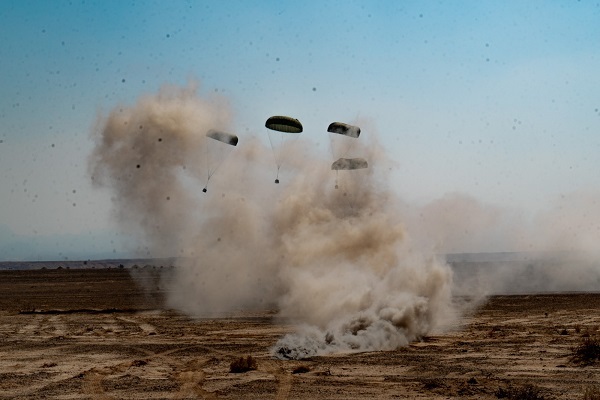 In order to optimize the IAF's airdrop capabilities, the forces need to train. 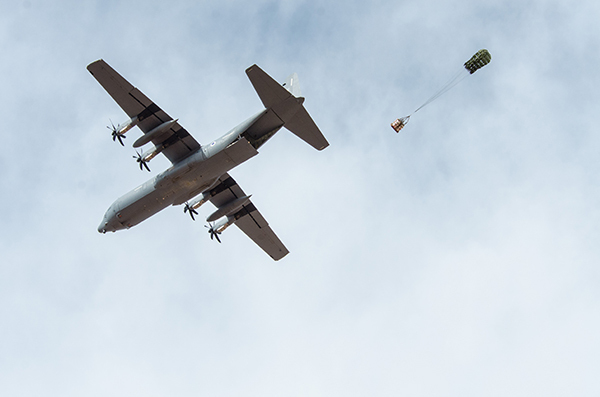 The 103rd ("Elephants") Squadron, which operates "Shimshon" (Super Hercules C-130J) aircraft, and the 131st ("Knights of the Yellow Bird") Squadron, which operates "Karnaf" (C-130HI) aircraft, recently participated in an airlift exercise. Airlifting is one of the "Hercules" Division's main missions. "The aircraft has the ability to carry large payloads of various types, from combatants and equipment to heavy, complex vehicles", elaborated Lt. T', a loadmaster at the 131st Squadron. "Airdropping cargo is essential to the ground forces' survival in the field". The four-day-long exercise saw the aircrews drill airlift under threat in enemy territory. "In order to perform our mission in the best way possible while also taking the threat at hand into account, we developed custom modes of operation at our squadron", elaborated Capt. M', an aircrew member at the 103rd Squadron. "One of the scenarios we drilled was airlifting a large payload to a certain area in a short span of time. We don't usually drill this scenario during routine, but mainly during airlift exercises". "The squadrons worked alongside logistics personnel on the ground in loading the cargos and performing airlifts as efficiently as possible", said Capt. M'. Lt. T' added: "The next campaign we participate in could be long. It's important that we're able to provide the ground forces with everything they need for carrying on with their mission". Over the past several years, the "Karnaf" aircraft has been in the midst of a modification process, which includes the upgrade of the aircraft's current systems alongside the integration of newer, more advanced systems. "The modification process was beneficial to the force's airlift capabilities", said Capt. A', an aircrew member at the 131st Squadron. "The new systems allow us to perform our mission in a simpler, more precise manner". Present in every transport aircraft sortie are the loadmasters – combatants necessary for proper performance of the aircraft's missions. Their job is to load and unload the cargo while commanding over the cargo hold. The modification of the "Karnaf" aircraft brought about a change in the 131st Squadron loadmasters' mode of operation. "It was a great opportunity to develop our airlift capabilities. The new method optimizes operation in the cargo hold and reduces the amount of potential malfunctions", said Lt. T'. SSgt. 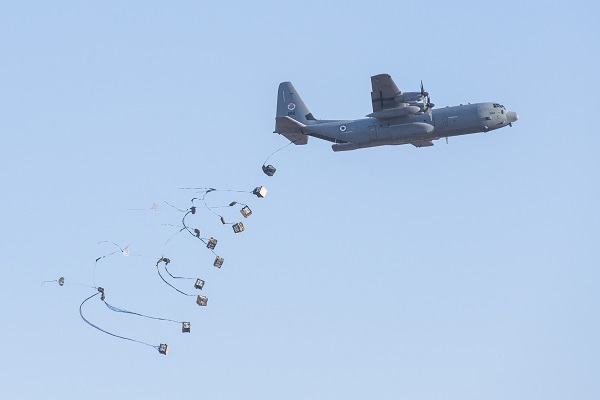 A', a loadmaster at the 103rd Squadron, added: "One of the challenges we faced in the exercise was preparing the supplies within the shortest span of time and at the highest level possible – this is what we focused on during the exercise".